Orleanna Price, the mother of the family, narrates the introductory chapter in five of the novel’s seven sections. The narrative then alternates among the four daughters, with a slight preference for the voice of the most outspoken one, Leah. The four girls increasingly mature and develop differently as each adapts to African village life and the political turmoil that overtakes the Belgian Congo in the 1960s. The Price family packs up their belongings for their flight to the Congo, where they are going to spend a year as the family of a missionary. However, shortly before leaving, they are informed that they are limited to 44 pounds of luggage per person. The Southern Baptist Mission League suggests they solve this problem by leaving for the airport wearing many layers of clothing, hiding household items among the layers of clothes to lighten their luggage. This is the first problem of many the Price family will face. The Price girls, Rachel, Leah, Adah and Ruth May, and their father, Nathan, attend their first church service in the village of Kilanga, and they realize how different their culture is from that of the Congo. For example, 14-year-old Leah helps her father plant a “demonstration garden”, and it immediately receives criticism from Mama Tataba, whom the family has engaged as a live-in helper. Nathan tries to hold an impromptu Easter celebration in hopes of baptizing numerous people, but he is not successful in baptizing even one, as the river along the village, where he plans to hold the baptism, is infested with crocodiles. Leah and her twin Adah begin to spy on Eeben Axelroot, the pilot who conveyed the family to Kilanga, and Nathan tries to convince Congolese men, one by one, to convert to Christianity. Meanwhile, five-year-old Ruth May befriends the village children. She finds out about Axelroot’s business with the diamonds after breaking her arm. After Mama Tataba departs, an orphan boy named Nelson becomes the family servant. Nathan and Leah go to Leopoldville (present day Kinshasa) to witness what is going on with the independence in the Congo. Methuselah (a parrot the Prices adopted from the previous missionary) dies, and Adah finds his feathers. Ruth May becomes very sick and lies in bed for the majority of the day. Leah begins to spend a lot of time with Anatole, Kilanga’s teacher, discussing topics such as justice and the Congo. Leah wants to participate in the hunt, which upsets the village elders, as it would go against their custom, but she eventually is allowed to participate and even hunts an antelope. The girls all gather together in the morning to check out the chicken coop. Inside they find footprints and a green mamba snake. A scream and gasp is heard from Ruth May, who has been bitten by the snake. The girls watch her turn cold and blue before she passes away. Orleanna becomes filled with guilt over Ruth May’s death. The rest of the sisters in the Price family go through many different life changes: Adah dedicates herself to getting a scientific education back home (she is hemiplegic and wants to learn more about the condition); Leah marries Anatole and they start a family together; Rachel remains very self-centered, goes through a string of marriages, and starts a business; and Nathan dies in his unsuccessful mission. The story ends with a final chapter from Ruth May reflecting on her sisters and mother attempting to visit her grave but not being able to find it, and a woman telling them a place named Kilanga never existed. She watches her sisters and her mother, and has seen how they have matured; she has matured as well. Through her death, she finally is able to understand the Congolese term muntu, which describes the concept of unity and how all life is connected in some way. She understands that she is muntu, and a part of all that is around her. Ruth May only wants her mother to understand the concept and for her to move on. She asks for her mother to forgive herself and not live with the guilt anymore. I do not think I can put into words how I feel about this book, or how I felt while reading. 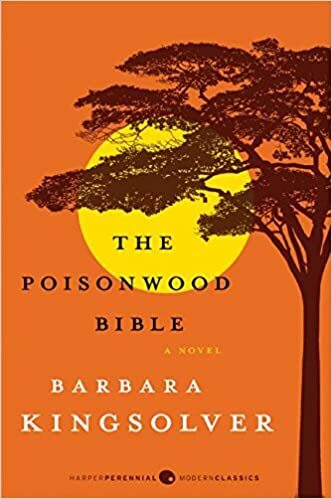 Barbara Kingsolver is to me a maestro of words and although she doesn’t bog down her prose with too much frill, what she does write immerses you in the human experience. I felt Africa in my heart while reading this novel, and I had and will always have such deep empathy for Orleanna and her children. I highly recommend this with both thumbs up in the air. This is a beautifully written book with inspired prose and deep insights. It looks at Africa and Africans with open eyes and a sensitivity to their heritage and culture. It also examines the role of missionaries in Africa, some of whom are good and some terrible. It is not a book for the deeply religious who cannot stand to see their own beliefs challenged or to acknowledge that there are other belief systems out there that are held just as dearly by their followers. I would like to site some of my favorite passages. I could never work out whether we were to view religion as a life-insurance policy or a life sentence. Mama says their skin bears scars different from ours because their skin is a map of all the sorrows in their lives. I pictured hands like those digging diamonds out of the Congo dirt and go to thinking, Gee, does Marilyn Monroe even know where they come from? Just picturing her in thr stain gown and a COngolese diamond digger int he same universe gave me the weebie jeebies. So I didn’t think about it anymore. Illusions mistaken for truth are the pavement under our feet. There are a lot of other passages and verbal images that I loved but I can’t copy the whole book here. However, there is one last thing I want to say and this is a complaint. A parasite of humans that extinguished us altogether, you see, would quickly be laid to rest in human graves, So the race between predator and prey remains exquisitely neck and neck. As always, it is impossible for people to understand evolution. This passage was supposed to have been said by a researcher at the CDC. It fails to understand that evolution is not forward looking. It is highly likely that this scenario has played out over the millennium for species that no longer exist. In fact, the Tasmanian devil is currently facing extinction from a viral form of cancer that fits this description. This kind of thing is more likely in small populations where genetic diversity is limited. Probably the human race has little to fear on this account. This book started slow for me, but it soon began to capture my attention. The characters are well developed and very complex. The story is engrossing…the struggles of a white mission family in the Belgian Congo in the 1950’s. It is told alternately by the wife and daughters of an pious but abusive husband and father. It follows the characters over several years and describes the impact that time in the Congo had on their lives as some return to the US and others remain in Africa through the rebellion and beyond.